We all admire those people who can turn any social media status update into something that goes viral. If you ever tried getting so many likes, comments and shares, you know it’s not easy. It seems like these social media users have magnetic personalities, and their well-maintained reputation allows them to get silly without being worried about losing any fans. If you’re a blogger who is trying to reach out to a greater audience; you certainly want to achieve that effect. How do you write shareable blog posts? Are there any rules, besides the good-old “be creative” advice? We have 8 writing tips that will make you the master of social media. Before we start with the writing tips, let’s clarify one thing: you absolutely need to put sharing buttons all over your blog/website. What if a read finds an awesome post at your site, but doesn’t see a sharing button? Do you expect them to copy and paste the link to their social media profile? That won’t happen. Put the sharing buttons at the top and bottom of each post, so you’ll make it really easy for your visitors to spread the word. Don’t try to reach a precise word count when writing a new update for your blog. If you have such goals, you may end up repeating the same ideas just to make the content appear longer. That’s not the kind of post people want to share. Although brief blog posts are really effective when you don’t have ideas or time for more elaborate content but you don’t want to miss a publication date, it’s still important for you to publish more complex posts. However, elaborate blog content has to be really good if you want to get plenty of backlinks with it. Your posts should be trustworthy and based on facts. When people want to prove an argument during discussions on social media platforms, they will link to these posts. The most successful bloggers have a secret: they leave some space between the writing and editing stage, so the post can sink in. When they return to it, they have a clearer impression of the mistakes they made, and they are not overwhelmed by the idea of making minor or major changes. Agorapulse – a nifty social media management tool, which helps you schedule posts for social media sites, create quizzes for your audience, and measure your achievements. Scholar Advisor – writing and editing service, whose team can help you make your blog posts perfect, regardless of the niche and topics. Pexels – a website that hosts a great collection of free stock photos that will make your posts look appealing. Piktochart – an easy-to-use tool for creating infographics with potential of going viral. When you use the right keywords in proper context, you get a greater chance for people to locate your posts through Google. How does that make you popular on social media? Well, when more people access your blog content through search queries, you’ll get a greater number of shares! It’s as simple as that. Make the headlines really great! Viral posts have intriguing headlines. That’s a rule with no exception. The title of your post is the first (and possibly the only) thing social media users see when you share a post. If you want them to click the link, you need to grab their attention. Don’t get this wrong: you should not turn the headlines into click baits. That trick may get you plenty of visits to the blog, but it will also get you a frustrated audience that won’t spare you in the comments. Thus, avoid a headline like Princess Diana Found in Spain if you’re trying to get attention for a post with photos of an anonymous girl who looks like the Princess. Maybe you’ll get a viral status on social media with the first blog post you present. That’s almost impossible to occur, but even if it does – what happens afterwards? You have to build and maintain a certain reputation that makes you an authority. When someone sees your posts on social media website, they should immediately get the impression that they are worth reading. You can achieve such status through great writing, thoughtful research, and a reliable publishing schedule. 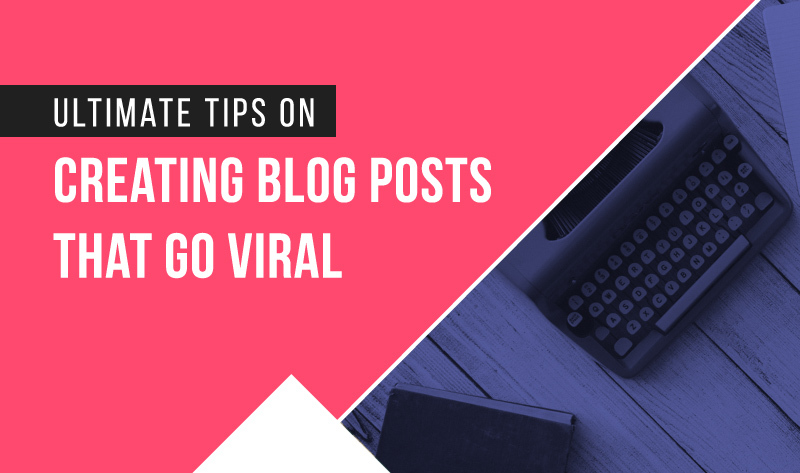 Those 8 tips can turn your blog post into viral social media content. Now, all you need to do is follow them to create content that your audience will fall for!